The Royal Hospital Chelsea was founded by King Charles II in 1682 as a refuge for soldiers of the army who had become unfit for duty, either after 20 years service or as a result of injury. On entering the Hospital an old soldier surrendered his army pension in return for board, lodging, clothing and medical care. The residents wore distinctive scarlet coats and black tricorn hats and would have been immediately recognisable. 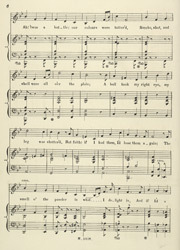 Songs such as this sung at Christmas time would have reminded audiences of their plight and would have encouraged charitable donations.